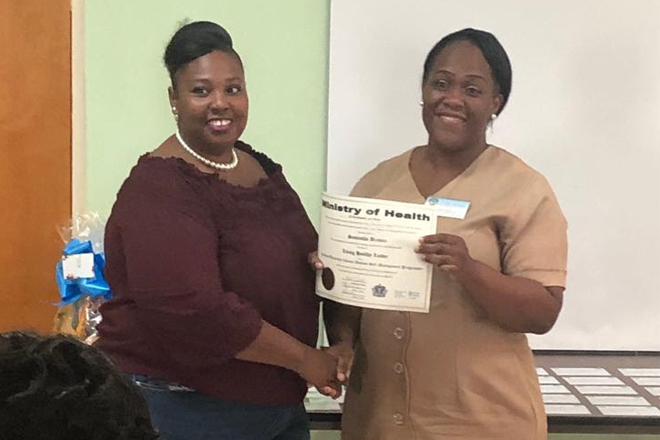 25 persons are now certified trained leaders in the Ministry of Health’s Chronic Disease Self-Management programme following a recent training session. The CDSMP programme, started by Stanford University, was introduced to the Caribbean region in 2015. Since its introduction to the Federation, there have been 42 trained living healthy leaders. The awards presentation was held on November 30, at the National Emergency Management Agency conference room. Special awards were given to Dr. Marissa Carty, Marlene Huggins-Stevens and Joann Charles for their significant contribution and demonstration of selflessness during the workshops. An “Above and Beyond award” was also presented to Joseph Richardson. The CDSMP programme has been shown to be essential to the management of chronic conditions such as cancer, diabetes and hypertension. Health planner, Sylvester Belle said that chronic diseases and other chronic conditions have gradually surpassed communicable diseases as the leading cause of morbidity and mortality in the Federation. The six-week workshops have been conducted throughout the year and will continue into 2019.